The issue I’m writing about may seem rather trivial to some readers. To be honest, I too was shocked that my co-workers and I had to fight so hard to be heard on such a small and seemingly obvious issue. The issue which management picked to draw a line in the sand over was providing a trash can in the dining area of the café I work at. Yes, a trash can. Something most customers and workers take for granted. Rightfully so, because who could imagine a counter service café with a bus your own table practice operating without a trash can? We’ll take care of the sorting. By not having a sorting station or a at least a trash can, management claimed it could ensure that all items would be properly sorted and that items that could be composted would not be mixed in with the garbage or vice versa. This was to demonstrate the company’s commitment to green business practices. Even though we were in a hyper-green-conscious city in which residents are trained to sort, recycle and compost whereever they go or otherwise feel guilty about not doing so, the company didn’t think its customers were capable of sorting their own garbage. Now, the “we” who do the sorting were my co-workers and I, and we thought we should have some say in this process, too. But, the company disagreed and retaliated when we did voice our concerns. I remember when the change went into effect, I grumbled a little bit to myself while working in the dishpit about the increased extra sorting. At that time I had no idea that the change would create a hazard for customers and workers or that it would be the issue that crystallized just how much the company valued its public image more than the concerns or safety of its employees. So, what? No garbage can. Sure, it’s extra work to sort through more items and it’s gross, but what’s the problem? That might be what you’re thinking and that certainly was the response we received from management. While finding disgusting items in the bus bins became a common occurrence, the situation didn’t catapult itself into a serious concern until a worker at another store was pricked by a hypodermic needle while washing dishes and sorting items found in a bus bin. The needle was buried amongst dishes, recycling, compost and garbage in a bus bin. The worker needed medical attention and testing to ensure that they weren’t infected with any pathological diseases. They would have to wait 3 months to get the all clear about not having hepatitis. You might ask, who would ever put a hypodermic needle in a bus bin? True. That’s a seriously stupid thing to do. But, the customer was only following the directions provided by management: “We’ll take care of sorting”. Rather than recognize that modifications were needed to make the trash disposal system safe to workers, management and the owners made no changes and told workers to be sure they wore gloves (equivalent to home-use dish washing gloves) and to be more careful. As a “family business”, I often wonder how the owners would have responded if it was one of their sons or daughters who was working in the dishpit and pricked by a needle? But, their children didn’t, and probably would never, work in the disphit of this “family business”. After about a year of individually bringing our concerns to our manager regarding the need for a trash can whenever we found a hazard, myself and other folks on the crew thought it would be worth bringing up at a staff meeting. Routinely we’d find bloody tissues and band-aids. Cyclists who took a spill on their way to the café would clean their wounds and leave the soiled paper towels in the bus bins. 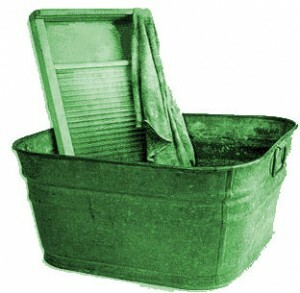 Every worker had a story about finding a hazard in the bus bins while washing dishes. Workers even found a dog feces bag and a soiled diaper in bus bins on two separate occasions, too. While agitation over the bus-bins certainly grew every time we found a hazard. The factor that proved most beneficial in pulling us together on the issue was management’s consistent dismissal of our reasonable requests. At the staff meeting, when the topic of safety concerns was raised, a worker brought up the concern about not having a trash can in the dining area. Several co-workers took up the issue and echoed his concerns. While our direct manager nodded his head to our concerns, he deferred to the GM for any response. The GM said that the decision was made by the owner but that she’d bring it up to her again (which we doubt she ever did). Continuing on, our GM stated that “we” had voted and that having a trash can was not in the “vision of the café”. I certainly didn’t remember voting on this procedure, maybe my ballot was lost. As the post-meeting conversation at the bar would reveal, our GM’s response only infuriated our co-workers. By suggesting that the decision was made democratically but that we didn’t have a choice in it was to in effect say that our input wasn’t worth asking for. No changes were made to the trash procedure and our continued individual requests for changes fell on management’s deaf ears. A couple months later, we had another staff meeting. This time we were more prepared. When the time was right I brought up the fact that we kept finding hazardous material in the bus bins and stated that a change needs to be made. A trash can was at least necessary. Again, my co-workers followed up with their support. Our manager again nodded his head and stated that he agreed, but claimed that it was out of his control. Before the topic was changed I stated, “Will you tell the GM and owner that we want a trash can?” Because the last time we asked for this we never got a reply, my co-workers and I felt it was important that we knew when this conversation was going to happen and that we later follow-up on what the response was from the owner. So, I ended the conversation by asking our manager when he would talk to the GM? In the post meeting discussion with co-workers at the bar, everyone felt good about bringing the issue up again and holding our manager accountable for a response. Two weeks after the meeting, myself and another co-worker approached our manager to inquire about if he had talked to the owner and what her response was about our request for a trash can. He said that he hadn’t spoken to her yet but would do so in the next couple days. Two days later, the owner responded with an email. The answer was “No.” There would be no trash can added, no change to signage, and no change to the disposal procedure. She stated that the kitchen gloves provided were sufficient. Getting yet again another “No” to our reasonable request served to further agitate everyone even more. We highlighted and posted the email for everyone to see. It became a symbol of frustration. Within conversations with co-workers, it became apparent that folks were not done with the issue and wanted to keep pushing for changes. We surveyed workers in the company’s other locations about their experiences and found that they had stories of their own of finding hazardous items in the bus bins. One of my co-workers suggested that we speak to OSHA and the Health Department to get the facts on whether the company was violating any ordinances. I told them that I thought we need to go to the owner directly as a group. He said he’d be down for that. When the response from OSHA came, the two of us met to read it over and discussed what course of action we would take. OSHA’s response was supportive, it was their opinion that a health hazard existed and that a trash can was needed in the dining area or the company would have to follow a lengthy hazardous waste disposal procedure that would be expensive to implement. While we didn’t need OSHA’s explanation to understand that a safety hazard existed, we felt like with this information the company had no legitimate ground to stand on. The two of us decided on drafting a letter with our demand and delivering it as a group to management. We felt everyone in our department would sign and the action would demonstrate our commitment to seeing change occur. Following meetings with two co-workers outside of work and another two discussions at work when the manager wasn’t around, myself and two other workers met to review the letter which we were collaboratively drafting. We set the date for the letter’s delivery and how we’d collect the signatures from our co-workers. Whenever we approached a co-worker, we provided them a copy OSHA’s response as well as a copy of the letter they would be signing. Within a week, we secured the signatures of seven out of the eight workers in our department. The only worker who didn’t sign had only started working for the company a month earlier. While initially supportive, her interest cooled off after a day of thinking about it. Based on our previous experiences bringing issues individually and collectively to management, my co-workers and I fully anticipated a follow up action to our letter delivery. Additionally, we assigned roles, prepared for the action day, and agreed to rendezvous at a nearby coffeehouse to prepare last minute details. Our shifts all started at the same time, so when we arrived we’d all clock-in together. I was assigned to get the manager’s attention to call him off the floor and into the office to talk. One worker would state why we needed to talk to him and what the issue we we’re addressing, while another would outline the back history of our repeated requests for a policy change. Then one worker would present the letters –one for him, the GM, and the owner– and state the names of everyone who signed the letter. I would close the conversation by restating the question of if our manager would change the policy as we had outlined. The action went off without a hitch and each of us nailed our roles. After the delivery, we spread the word to our co-workers on shift about how it went. An hour and a half later, a co-worker showed me the hurried email response from our GM that said she was already going to get us a trash can but that it just “fell off her radar”. She ended the email by stating that she would order a trash can for the cafe that day. None of my co-workers believed the company was actually in the process of getting a trash can; it had already been over a year since we first asked for one. All of the workers agreed that it was our letter delivery that made it happen. Management’s cave in on the issue of the garbage can was a definable victory for us. However, the issue would prove far from settled anytime soon. Management did not switch the disposal system to a sorting station and continued to resist any changes to the signage directing customers to put everything in the bus bins. One outcome of the letter none of us foresaw was that the trash can they ordered stood one foot tall and was about the diameter of a coffee can. Workers in other departments who we had told about the action approached me to empathize on how much of a slap in the face the tiny trash can was. As a result, the organizing continues. We’ve done another march on the boss, this time presenting the OSHA information, and winning greater safety measures around the disposal system. We’ve also collectively presented our revisions to the signage around disposal of trash. Following the letter delivery, I was labeled the troublemaker behind the action. I was approached by the GM the next day about the issue while no one else was followed-up with. In my next review I was told I was “adversarial to management” and when I asked for an example, my manager referenced the letter delivery. He called it “dramatic” and “theatrical”. While the trash can size is insufficient, the action demonstrated to the co-workers involved in the action and those in other department who witnessed it that we don’t have to simply resign ourselves to degrading work conditions. Instead, we can organize ourselves and the changes we want to see happen in a collective manner and win improvements with speed. Furthermore, it clearly showed that no matter how many managers have open door policies or how often they tell us to come to them first with their issues, that the only way they actually HEAR us is when we speak and act together as a group.